Summer has been here for a while now. This dish right here is the best way to beat the heat. I have been known to go and float in the ocean 3 times a day if it’s sweltering. We do have air conditioners in our apartment, but sometimes, the thick, oozy air combined with the salty, briny water just feel the best. Our friends came over for dinner one night and brought dessert. (Side question: Do you all remember how to spell dessert with two S’s because you want more?) It was perfect. They brought a creamy, coconutty, chewy and slightly sweet concoction that I had never had before. This dessert is incredibly refreshing, I would recommend anyone make it on a hot day. Tapioca pearls. I bought a bag on Lamma at the shop across from the cheese shop. All you need to do is start boiling you water, and dump on some tapioca pearls. I used about 3 palmfuls of tapioca, so maybe that’s 2 handfuls for you normal sized hand people. They will take about 20 minutes to boil all the way through. Dump out your excess water. Rinse with cool water if you feel inclined. I didn’t have any clean (boiled) refrigerated water. I was thinking ahead though and had stuck the evaporated milk and coconut milk in the fridge. Feel free to do the same. Up to you. Chop up your mangoes. There is a debate on the correct way to prep a mango. Peel then dice. Lob off the sides, score, and scoop. I’m also going to leave this up to you, because I am not your mother. My mangoes were exceptionally ripe, so I scooped. 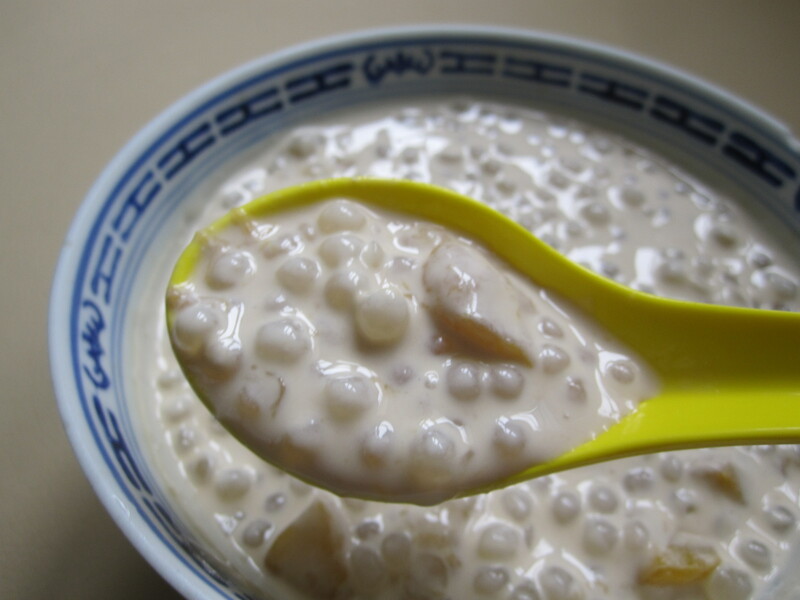 Dump your tapioca pearls into a mixture of your coconut milk, evaporated milk. Scoot the mangoes off your cutting board and into the bowl as well. Let them all party together in your fridge until cool. If you are in a hurry, let them dance around in your freezer. If you’re me, get up every 10 minutes to see that it’s actually cooling and take a bite. If you’re not like me, don’t bug it and let it cool down properly. Once cool, taste it. Decide if you want to swirl some honey in. I wanted a bit more sweetness, so I did. Fella and I decided we could probably just use regular milk instead of the evaporated milk, but that’s an idea we had that we have yet to try. You can also replace the mangoes with taro,bananas. I am guessing raspberries or blueberries would also be good. I’m not sure why I keep wanting to add to the list of your options. You know what fruits you like, no need for me to continue listing them. I’m also pretty sure a scoop of rainbow sorbet wouldn’t hurt either. If you make this, I’d love to hear if you love it as much as we do. *This dish can be spilled. If you are a Walking Dead fan, but tend to be a tad on the jumpy side, you might want to eat at the table while watching, and not in bed. Hmmmm. I wonder where a girl in Minnehappiness gets tapioca pearls…since the shop across from the cheese shop is a bit out of my way. 🙂 And I wonder if I could substitute some dairy-free beverage for the evaporated milk? Must try it as I don’t think I have ever had tapioca. Go figure! How to prep a mango? Here’s what I do although I doubt it’s the “right” way. Cut in half and pull gracefully apart. (HA!) Remove pit or gently cut around it until it’s out. Hold half of the the mango in your left hand and score the flesh gently with a knife taking care not to pierce the skin (and your hand!) on the other side. With your thumbs “flip” the scored mango half inside out and simply carve the mango meat away from the skin. Repeat on the other side. Okay, now I want mango! Hi Rachel! Miss you too! I think you can use any sort of milk you want, soy, rice, etc. This is what I think will taste good, not necessarily what is ‘supposed’ to happen with this recipe. I am pretty sure you can get tapioca pearls at most grocery stores, if not, there are a handful of decent Asian markets in St.Paul. If I remember right, you were about to move to St.Peezy when I left….correct? There is one that is pretty large over near West Minnehaha. Let me know where you do end up finding them.